I'll admit it. One of my favorite things about teaching is setting up my classroom for a new school year. It's my "home away from home" for 10 months out of the year so it's something I put a lot of time, care and frankly-money into. This year I needed a bit of change. I have been using a royal blue and lime green color scheme for a few years and I wanted to change it up a bit. I decided to go with black which is a trending look this season. We have tables rather than desks in first grade so I arranged the tables into L shapes. In the center of the L's are these plastic storage bins that I got at Target. 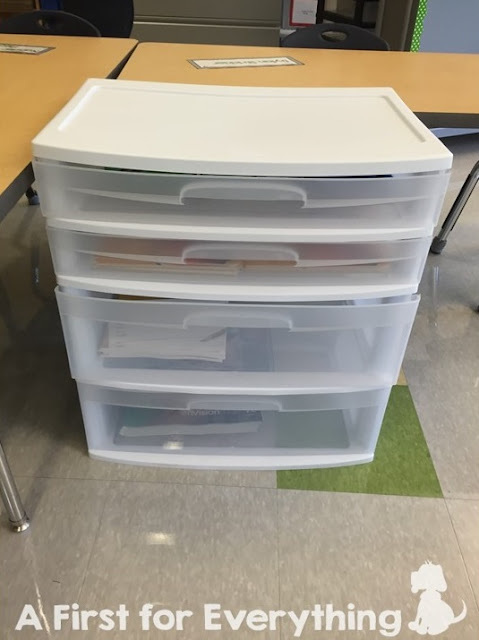 Each table of 4 students has one of these bins. 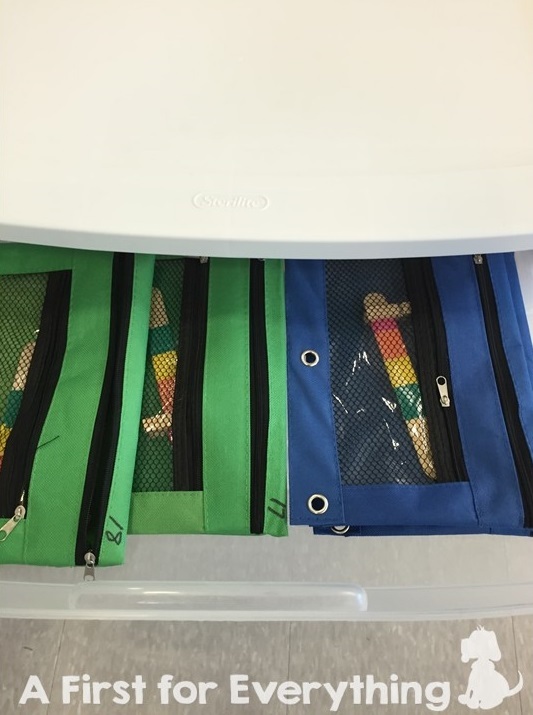 In the top drawer are our behavior clips and storage pockets. If you are in need of a discreet behavior management system you can check out the post here. In the second drawer, we keep our magnetic boards and letter tiles that go with our Fundations phonics program. The third drawer contains our Fundations writing journals. 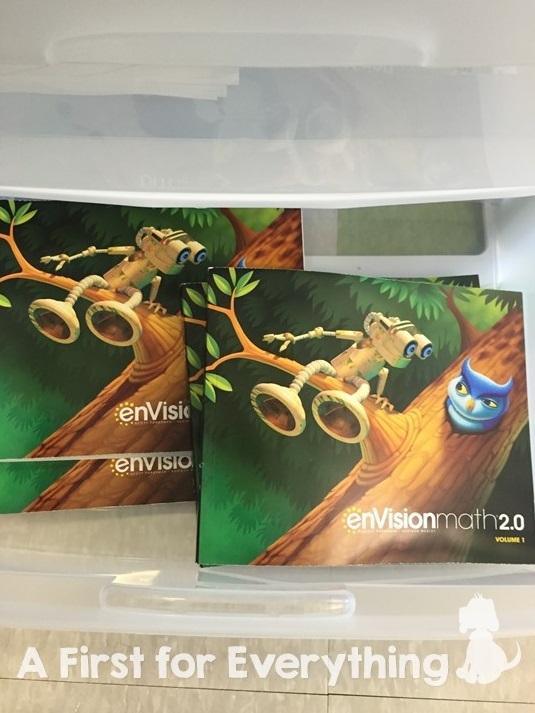 The last drawer contains these behemoths math journals. 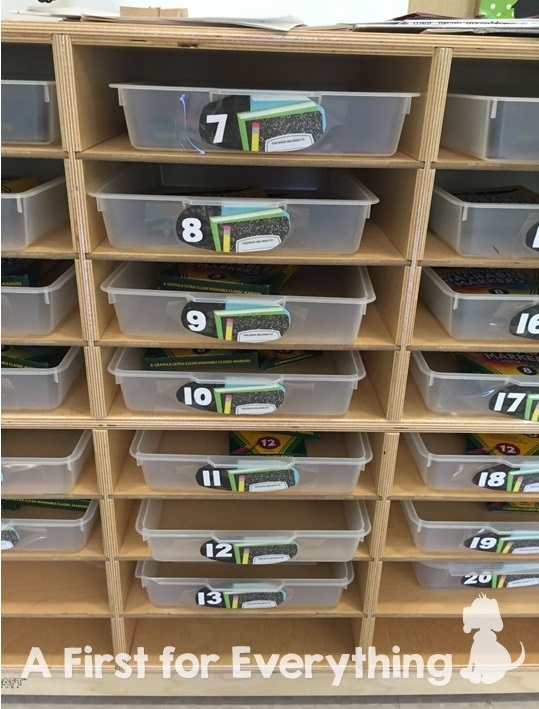 We will store pencil boxes on top of these bins. Another way I store student supplies is in these bins that my school provided. 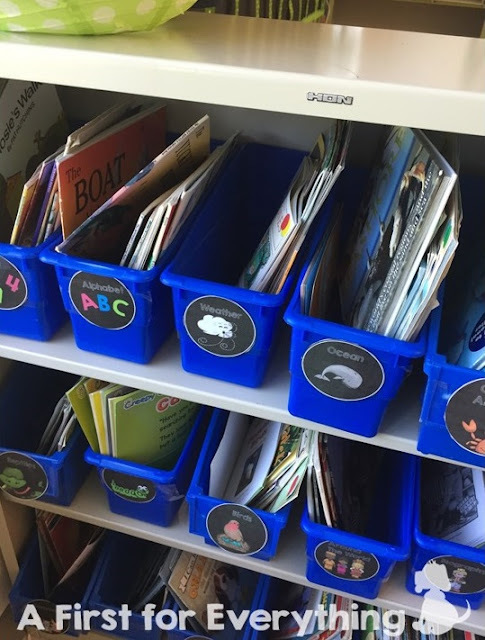 The labels are from Ladybug Teacher Files and they are free! 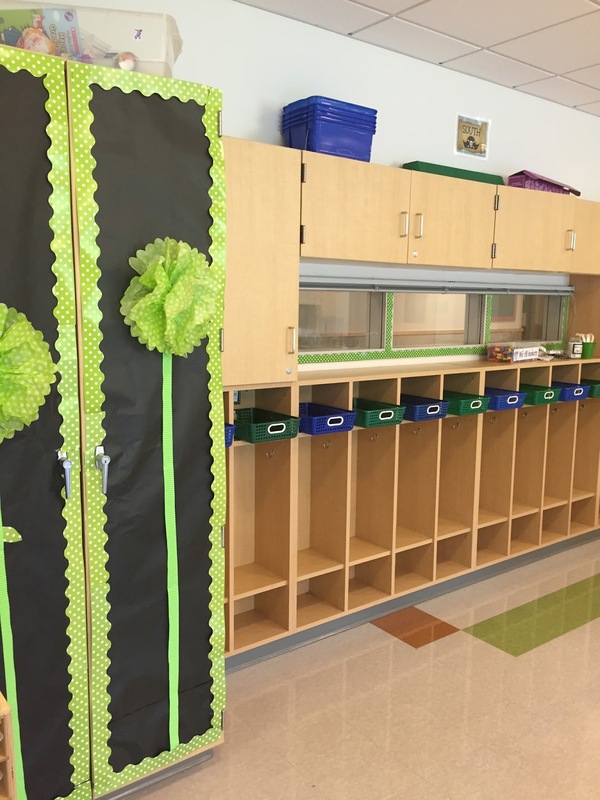 I call these cubbies and in these each student sores their colored pencils and markers. These are items that we don't use every day but yet they are still accessible when needed. 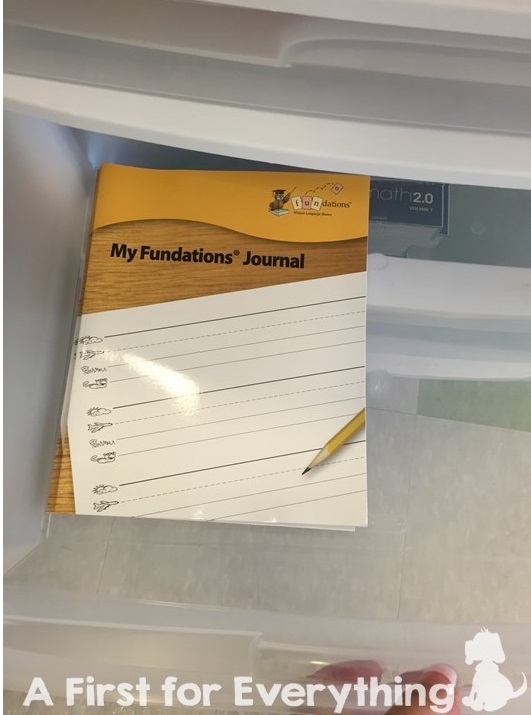 I also give students a colored folder for each subject area. This is for ongoing work that we are continually working on (red-writing folder, green-science, yellow-social studies, and so on.). 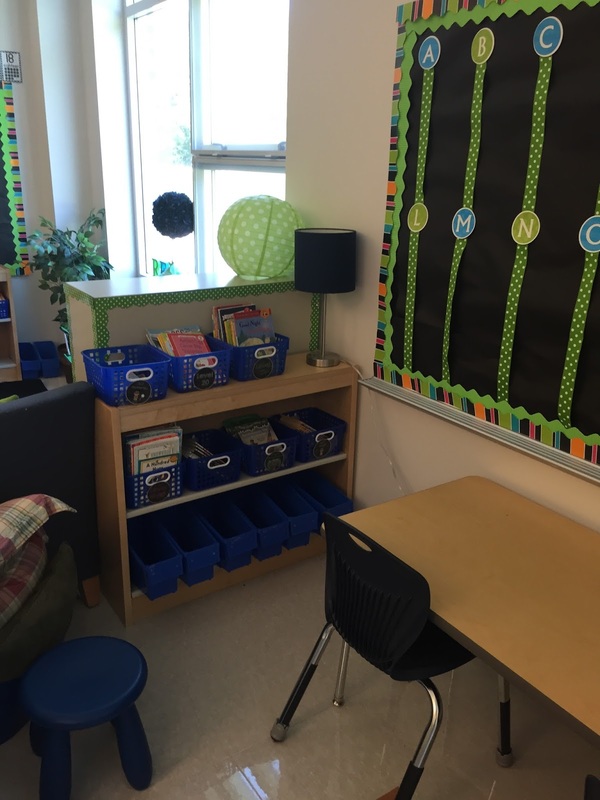 Students also have what I call mailboxes (the green and blue baskets) where they store completed work to be sent home that day, notices, etc. 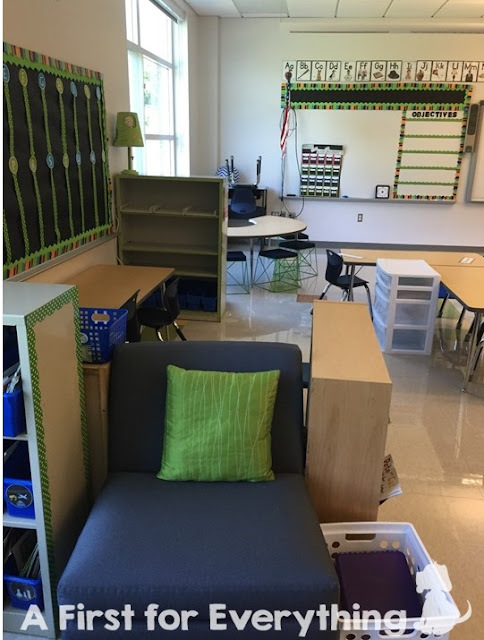 At the end of the school day, students take their backpacks to their table and I call students one at time to get the mail out of their mailboxes. They then put the mail in their take home folders. I like to decorate my closet doors just because I like the look. 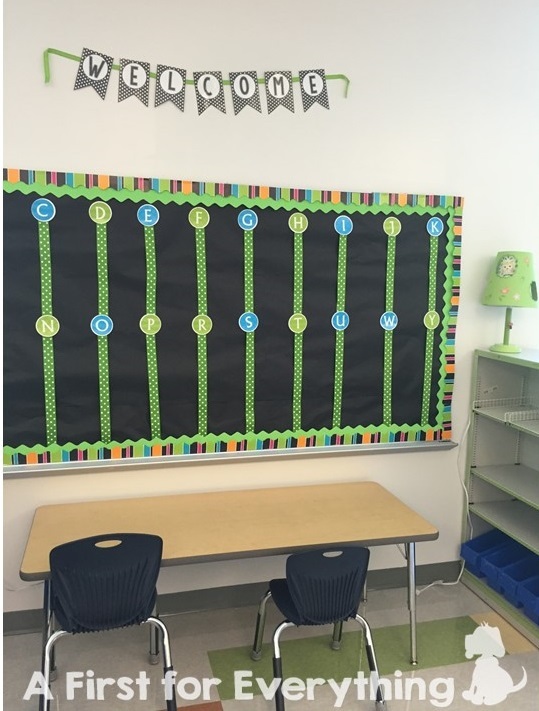 Inside the closet, I hang my brag tags on command hooks for easy student access and to avoid tangling. 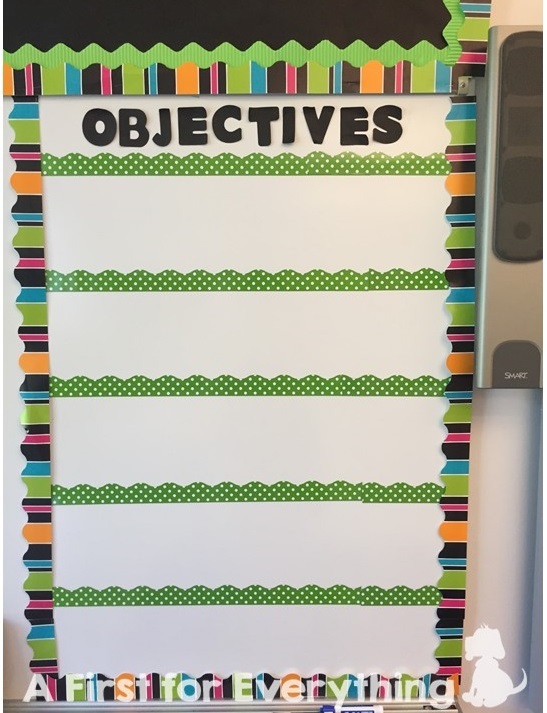 We are required to post objectives so I used bulletin boarder to make it pretty. 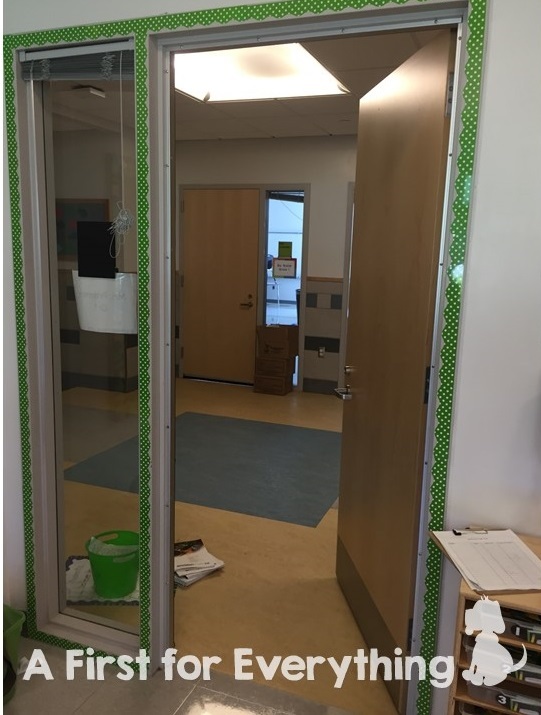 The black border is by Trend and the green with white polka dots are magnetic strips that I ordered from Really Good Stuff. 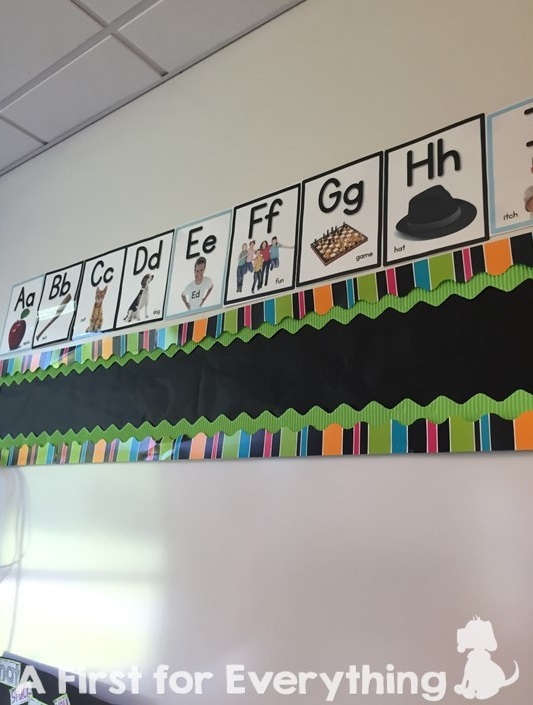 Adventures in Kindergarten.This is the same alphabet images that our phonics program, Fundations uses but these images by Adventures in Kindergarten are much more authentic and pretty. You can find them here. 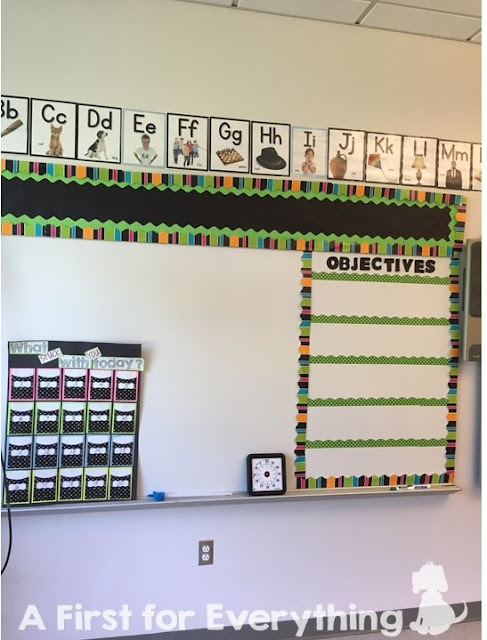 I loved using ribbon on my word wall this year. I bught 4 rolls to complete this bulletin board at Joann's. This is actually not a bulletin board, but rather a whiteboard, that I cover with bulletin board paper. The welcome sign,clock décor, and number posters below are from my Black and White Classroom Décor set that can be found here. 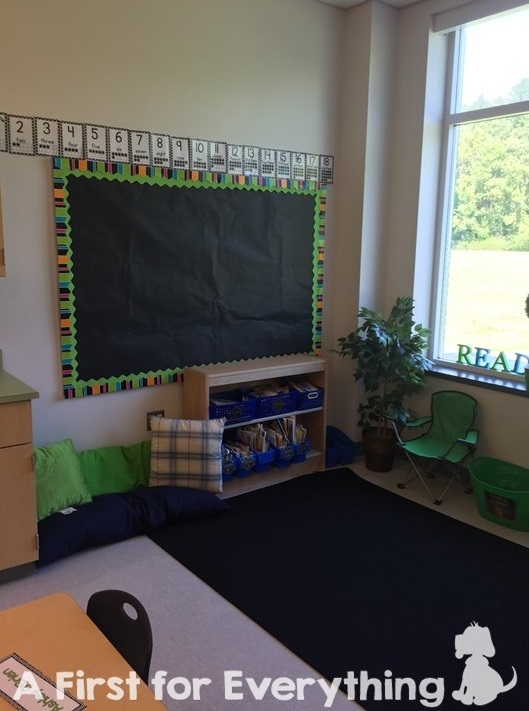 The reading area is my favorite space in the classroom. I continued to add the green and white polka dot magnetic border on my metal book shelves which added a nice touch. I also like to add lamps and plants to the classroom and picture frames of previous classes for warm touch. These library labels are available in my store in black and white here. 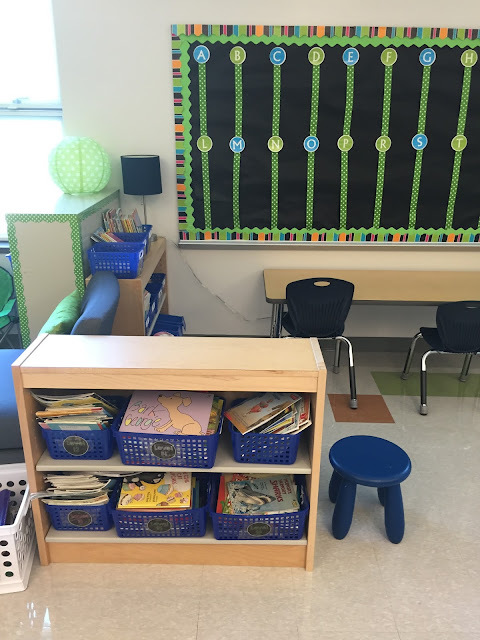 I bought these stools on sale at Target for $5 a few years ago and I love them. 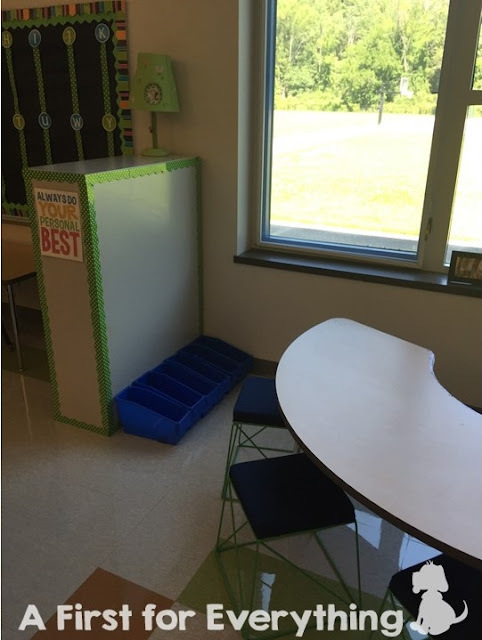 I think having the side of the metal bookshelf which is magnetic, will be useful next to my guided reading table. 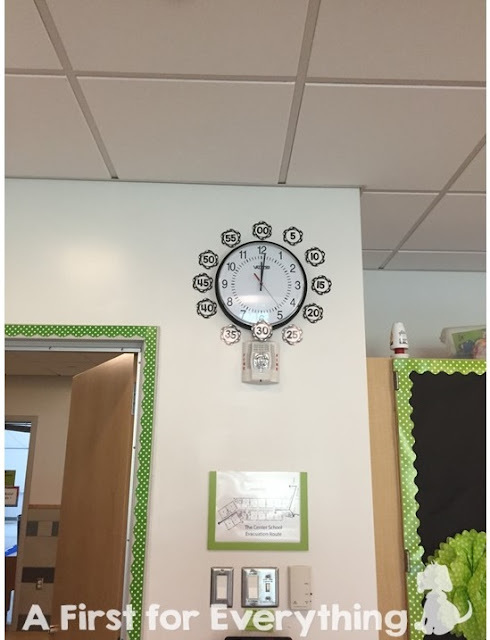 I envision using it with magnetic letters for word blending. I really went all out with the magnetic polka dot border. And I still have some left over! 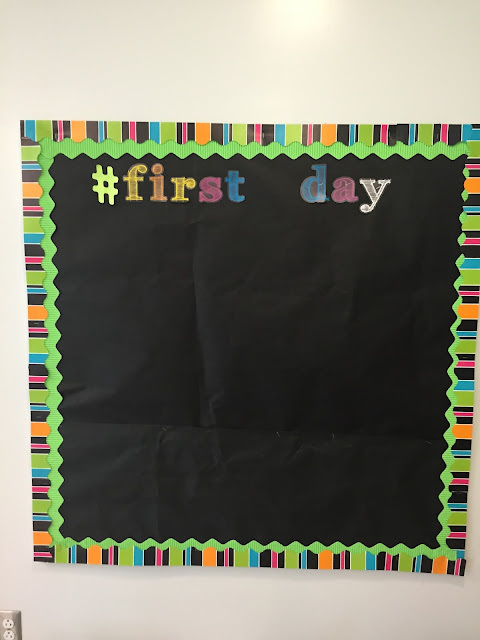 I will be using a class Instagram account this year and this bulletin board will be dedicated to our Instagram photos. I will change the photos based on theme, what we are working on, student of the week, etc. 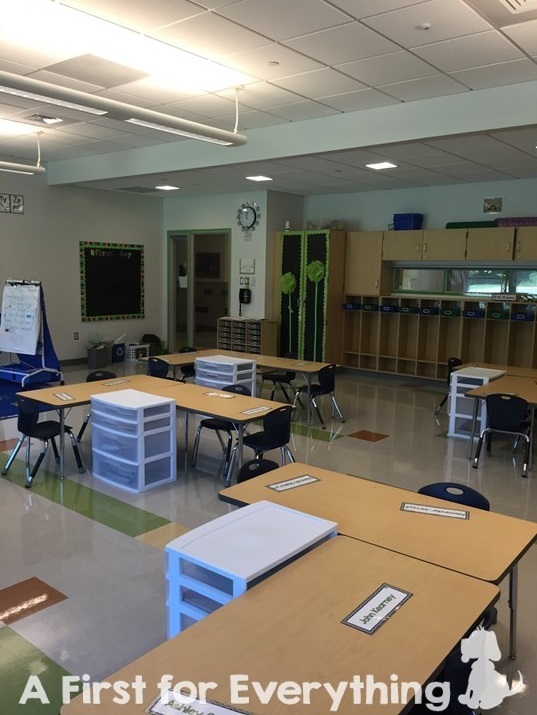 Well folks, that's my classroom. I can't wait to go back and meet my new students. I'm really excited! I love your word wall idea with the ribbon! 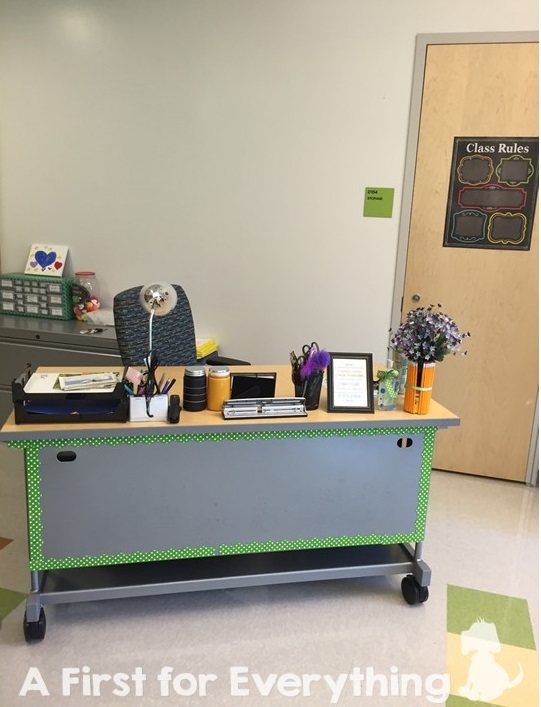 I have the same colors in my classroom - do you have the alphabet letters for the word wall on your tpt store? Hi Kristin, Thanks so much. 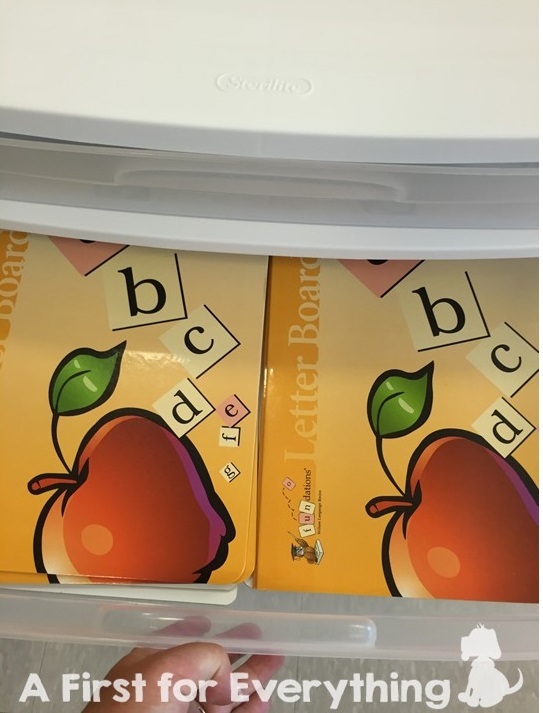 The letters on my word wall I purchased at Lakeshore Learning.